"This is a fun, healthy recipe to change up your Mexican meals. Bet you almost can't tell that there isn't meat! Use as substitute for meat in tacos, enchiladas, or your favorite Mexican meals. 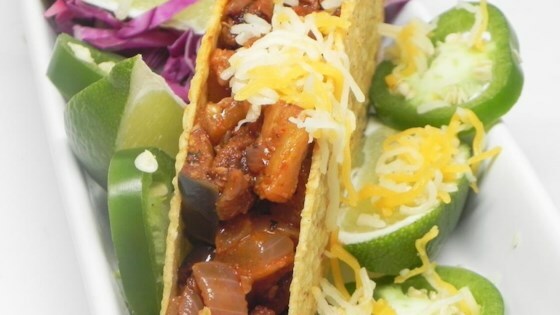 Fill taco shells with eggplant mixture and top with your favorite fixings!" Heat 2 tablespoons olive oil in a large skillet over medium-high heat. Stir onion, lemon juice, garlic, and jalapeno pepper into skillet; bring to a simmer and cook until onions soften, about 3 minutes. Stir eggplant, cumin, paprika, chili powder, black pepper, and seasoned salt into onion mixture; drizzle remaining olive oil over the top. Cook, stirring occasionally, until eggplant reduces in size and softens, about 15 minutes. Spoon eggplant mixture into tortilla shells. See a quick-and-easy way to make perfect fried eggplant. This tasted amazing and was so quick and simple! I used flour tortillas instead and topped it with cheese and salvodorean sour cream. Very good. We topped it with cheese, fresh diced tomato, diced red onion, boiled sweet potato and a squeeze of lime. Next time we may add a little sour cream and cilantro also. These were pretty good. I added some chopped tomato and red bell pepper. Only 4 out of 5 stars because it gave me terrible heartburn. Now a staple at our house. Need I say more?